Metastrongyle infections due to Angiostrongylus vasorum (dog lungworm), Aelurostrongylus abstrusus (cat lungworm) and Crenosoma vulpis are widespread throughout the UK with hotspots of infection in certain geographical areas. In our experience these infections appear to be on the increase with multiple presenting clinical signs and one confirmed death at post mortem. Dogs contract Angiostrongylus vasorum infection by ingesting the L3 larvae in the intermediate host - snails and slugs. The L3 larvae migrate to the mesenteric lymph nodes and mature into L5 larvae before migrating via the lymphatics, liver and caudal vena cava entering the right ventricle and pulmonary arteries by the 9-10th day after infection. Thread-like adults develop in the pulmonary circulation and deposit eggs in the terminal pulmonary capillaries. The eggs hatch; larvae escape into the alveoli and bronchioles and are coughed up and passed in the faeces of the host where they are ingested by slugs and snails feeding on the faeces. 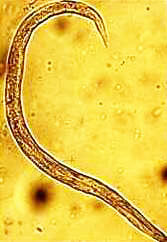 The presence of the adult nematodes in the lungs cause an immunological response which is the basis for many of the clinical signs and subsequent pathology of the disease. Crenosoma vulpis infection shows the same lifecycle but produces a mild inflammatory response presenting as a productive cough. Aelurostrongylus abstrusus in the cat follows a relatively similar lifecycle with birds and rodents as intermediate hosts, but pathogenicity is low. However the presence of the adult worms in the airways can provoke an intense inflammatory response causing significant respiratory disease. Coagulation abnormalities: prolonged bleeding, prolonged capillary refill time, haematochezia, subcutaneous haematoma, and other signs of thromboembolic disease. Plus general signs of unknown aetiology: anorexia, cachexia, pyrexia, malaise, collapse. Common haemogram abnormalities included thrombocytopenia, hyperglobulinaemia, eosinophilia, neutrophilia and anaemia. Some clinical cases can have hypercalcaemia. Thoracic radiographs can show abnormalities such as a patchy alveolar-interstitial pattern affecting the dorsocaudal lung fields, bronchial thickening and mild pleural effusions. Definitive diagnosis requires the demonstration of L1 larvae in the faeces using the Baermann sedimentation technique. In suspected lungworm infections, due to the intermittent nature of shedding of the larvae, it is suggested that in order to exclude the diagnosis it is necessary to examine multiple faecal samples over a 1 week period. Larvae can also be demonstrated in BAL samples, but this technique is less sensitive and false negatives are common.